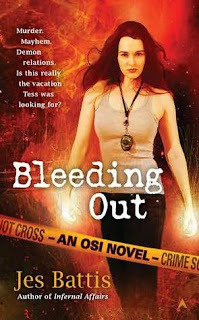 Jes Battis' 'Bleeding Out' is the fifth, and final book in the OSI series featuring Tess Corday, a woman in touch with the earth, if not her own feelings. This final installment sees OSI Detective Selena Ward calling Tess and Derrick in to deal with the investigation of a high profile murder, that of Lord Nightingale, who is the highest ranking necromancer and the governor of Trinovantum. When an author wraps up a series, particularly if it's a lengthy one, there are a lot of loose ends to check off. Sometimes, making sure that everything is neatly taken care of can make the book feel like it's a list of events, with characters explaining what’s going on. At other times it gives the reader a feeling as if they've shut the door after a long visit with old friends that they can remember fondly. In some ways, Bleeding Out does exactly this very well. No character is left hanging, but at the same time, the pace of the book is so comfortable that the reader doesn't feel any urgency. Yes, there are some vampires 'juiced' and acting kind of freaky, but they lack any true menace. It feels more like the neighborhood kids got a little uppity, and OSI has to step in and remind them that there's no feeding on people without their consent. Although there isn't any imminent peril to Tess or her little family, issue of her past, as well as that of her necromancer boyfriend Lucian do come to light. Among those is the truth about Tess' father, as well as some things that her mother has been concealing from her. In short, Bleeding Out is well written, but at times almost too neatly done; the kind of final chapter that leaves readers satisfied, and won't annoy anybody who's been hoping for a few more answers to lingering questions in the OSI series.